This project evaluated the performance of a small-scale grid-tied vertical axis wind turbine (VAWT) installed at the wind turbine test field of The Living City Campus (LCC) at Kortright in Vaughan, ON. The commonly claimed advantage of VAWTs over the more popular horizontal axis (HAWT) design is that they are capable of harnessing the wind from any direction without the need for a yaw mechanism. That being said, there are disadvantages as well and these vary across different VAWT designs. Darrieus VAWTs use lift force to rotate with high speed and low torque. While their efficiencies are comparable to those of HAWTs, they are not self-starting and require additional methods of over-speed braking. Alternatively, Savonius VAWTs rotate by cupping the incoming wind, creating a drag force. They are self-starting, low-speed, turbines but they have generally poor efficiency and are typically relegated to niche applications requiring high-torque. The VAWT examined in this study was a hybrid 700 W Darrieus-Savonius design (termed a HiVAWT) that is claimed to have the self-starting properties of Savonius turbines while maintaining the higher efficiency Darrieus designs. 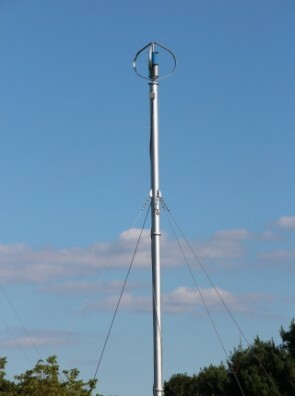 At the LCC test site, the HiVAWT was installed adjacent to a meteorological tower collecting wind data. Notable control issues were encountered during the system commissioning. The load curve was inadequate to prevent the turbine from going into over-speed protection, which resulted in rapid on/off operation. To circumvent this issue, STEP researchers programmed a more optimal load curve. The researchers also noted large tare losses from the turbine control cabinet, which degraded performance further. Data was collected during May, June and July 2015. Wind speeds were low during this time and it was not possible to fully trace out the performance curve. Ultimately, the high tare losses, low wind speeds and poor turbine performance resulted in a net consumption of energy by the system. This result applies to this specific brand and model of wind turbine and is not indicative of all wind turbines, especially large-scale HAWT turbines that are among the most cost-effective renewable energy technologies. Data collection is planned to continue over the course of a full year to enable an improved assessment of the turbine’s performance.